25th February at The Rose Centre and upstairs in THE COMPANY ROOM. 7.30 pm. In order to vote at the AGM you need to be a registered Member of Company Theatre. Membership of Company Theatre is free. It is for those who wish to be active within the society - whether on the stage, backstage or helping with the Front of House duties eg serving the tea and coffee, for each show. If you wish to be part of the FOH rosters then please sign up on the MEMBERSHIP page. The AGM will start at 7.30 and will be followed by light refreshments and a chance to chat about the year ahead. Nomination forms to stand for committee will be available on the night. AGM - Feb 25 - See at left. 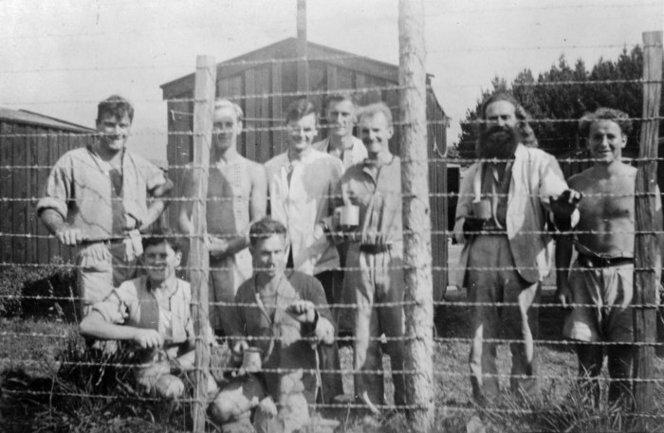 Above photo : HAUTU prison camp for conscientious objectors. "Being involved in the current Company Theatre production of Peace Plays by Kathleen Gallagher is one of the most challenging and rewarding experiences I have had. Under the skilled directorship of Steven Arnold, each character has emerged through a workshop process to become a multi-layered and multi-faceted person, each with a history and network of relationships which inform and illumine every aspect of the story. To be able to address the issues raised by various aspects of war, - whether the horrors of nuclear fallout or the complex questions caused by pacifism and conscientious objectors - is both a privilege and a challenge. As we pause to mark the 100 years that have passed since Gallipoli and the 70 years since the end of the second world war, these are live and vital questions for us all as we try to find a way to live positively in this world of fragile peace and senseless killing. Everyone involved in the production hopes that they will provide the opportunity and spur for some thought and discussion on these important issues." Jan Judson, actor, from Peace Plays. See below - there will be times during the season to partake in a discussion. Check the website and we'll send you a reminder email in early March so you don't miss out. To BOOK now phone Kath at The Rose Centre on 445.9900. This is a great show to enjoy a theatrical "experience". There will be multi media elements and LIVE music as well. NB After both matinees - ie Sunday 15th and Sunday 22nd, there will be a discussion opportunity with the director, Steven Arnold, and members of the cast. Book early, this should be a very interesting afternoon's theatre and discussion. A reminder of our shows for this year: If you are involved with any fundraising groups, have a look on the website for full descriptions and pencil in a booking for your group. We expect our usual full houses! Once again, dear friends of Company Theatre, please email if you'd like to be on the FOH roster for Peace Plays. The dates are 14 - 28 March. I always ask before each show, as with our busy lives sometimes the dates just don't suit, so easier if you can email....Just a YES to sherryede@hotmail.com will be fine and I'll email you back. Company is very pleased to have Lesley Hawkey helping as Assistant Front of House Manager for 2015. We will be holding a refresher course for FOH volunteers in early March to give full information and confidence to new members of the team.